Ornamental cabbage and kale look and grow very much like their close relatives of edible cabbages and kale. Although you could eat them, they have been bred for looks, not flavor. Their leaves have been hybridized to feature purple, rosy, and creamy white colors, making them look more like large flowers than vegetables. Plants with smooth leaf margins are called flowering cabbage, while those with serrated or fringed leaf margins are considered flowering kales. Just like their edible cousins, ornamental cabbage and kale are cool-season annuals. Ornamental cabbage and kale look especially good in a large planting or as edging plants, where their purplish hues blend in well with other fall colors. Or, use them to replace warm-weather annuals in your containers over the winter. Growing the ornamental versions is not much different from growing regular cabbage or kale. Although you can plant them out at any time, the colorful pigmentation doesn't develop until after frost or prolonged cold weather. If you plant them too early in the fall or late summer, the plants will get leggy and remain green. It's the leaves that provide the "flowers" in ornamental cabbages and kale. If you are buying plants, they will probably already be mature and open, although the color will probably intensify as the temperature drops. If you are starting them from seed, give them about 11 to 14 weeks to reach full size. That means you will need to start them in late spring or early summer for a fall planting. Opt for larger plants when buying them as they may not grow much after planting. Once cabbages get root bound, the top portion becomes stunted. Look for plants with short stems and relatively uniform length leaves, no holes, and at least a hint of color. If any flower stems appear after you have planted them, cut them off to prevent bolting. They will do fine in either full sun or partial shade. When grown in warmer climates, partial shade is preferable. Both cabbages and kale prefer a slightly acidic soil pH of about 5.8 to 6.5. Rich, well-drained soil is best. These plants like to dry out slightly between watering but will suffer stress if left dry for prolonged periods. If your usual cool weather climate includes rain, you probably won't have to water at all. If there is a long dry spell, water occasionally. Ornamental cabbages and kale don't develop their full colors unless they get a good chill from a frost. They can last throughout the winter, but their appearance depends a lot on the weather. Too hot and they will bolt to seed; too wet and harsh and they’ll look tattered. They will survive as long as temperatures remain above 5 degrees Fahrenheit. However, a sharp drop in temperature can damage or kill plants that haven't been acclimatized. Since most pests are scarce in the cooler months, there aren’t too many problems to look out for. Aphids seem to be the most persistent pests, although cabbage looper and leafroller are still active in some areas and powdery mildew can become a problem if the weather remains damp. Fertilize only at planting time using a balanced fertilizer such as 10-10-10 or 12-12-12. Don't fertilize while growing or they can lose color and get leggy. "Chidori" flowering kale has very curly leaf edges, with leaves that are purple, creamy white, or deep magenta. 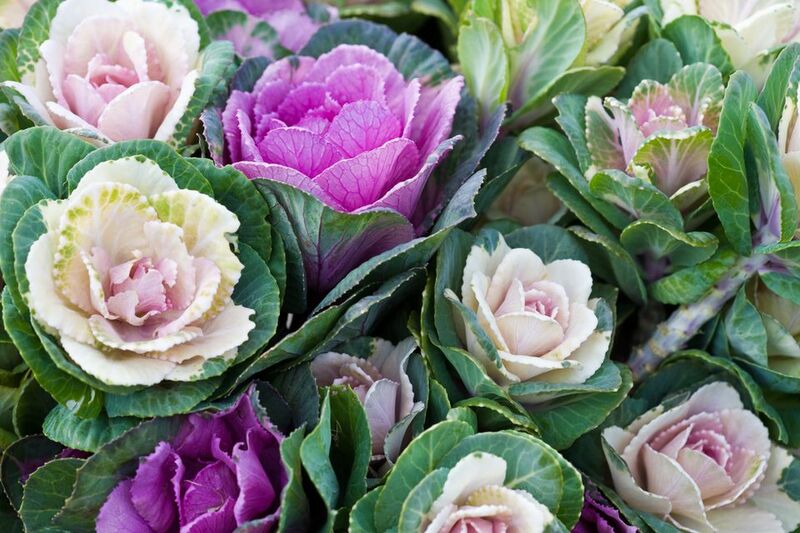 "Color Up" ornamental cabbage grows upright, with green leaves and centers of white, pink, or fuchsia. "Osaka" cabbage has large, smooth leaves and center colors including pink, red, or white. "Peacock" flowering kale looks more like its edible cousins, with looser growth and deeply serrated leaves in red, purple, or white. "Pigeon" grows on a tall stem and can be used in floral arrangements. If you only want one or two plants, they look less out of place in containers than they do scattered throughout a garden. In fact, they make nice, long-lasting replacement plants for spent summer containers. Keep in mind that once root bound they won't grow much. Sow seeds three to four months before you need full-sized plants and at least six to 10 weeks before a frost is expected. If you ​start seeds in cell packs or flats, be sure to transplant to larger pots as soon as the first true leaves appear. You don’t want to risk them getting pot bound so young. If seedlings get leggy, you can replant up to the bottom of the cotyledons. You could also simply direct seed your cabbages in the garden since the weather will be warm. Cover lightly with soil and keep the soil moist until germination. Seeds should sprout within one to two weeks. Thin to about 18 to 24 inches apart, when seedlings are three to four inches tall.